George Garton in action for Sussex during the 2017 season. England take on a Cricket Australia XI in Townsville in a four-day match that starts in Townsville on Wednesday 15th November. Garton has been added to the squad for that fixture following the ankle injury sustained by fellow seamer, Jake Ball, in England’s current warm-up match at the Adelaide Oval. Following the conclusion of the Townsville match, Garton will rejoin the England Lions party for their camp in Brisbane and Perth. George is a product of the Sussex youth programme, first representing the county at under-10 level. After spending two years in the Academy, he signed his first professional contract as an 18-year-old at the end of 2015. 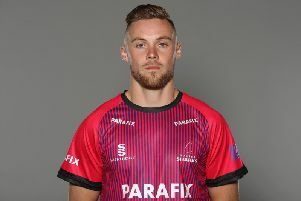 He made his first team debut at the beginning of the 2016 season, and since then has played eight first class, ten one-day and twelve T20 matches for Sussex, taking 46 wickets across all formats.